For those of you who have been around these parts for awhile, I am sorry for another repost, but it is apropos, delicious, healthy, and I don’t have a new post so there you have it. Resolutions, most of us make them at this time of year and most of us have sadly thrown in the towel in about 3.2 weeks; I have read that stat somewhere but I don’t remember where. 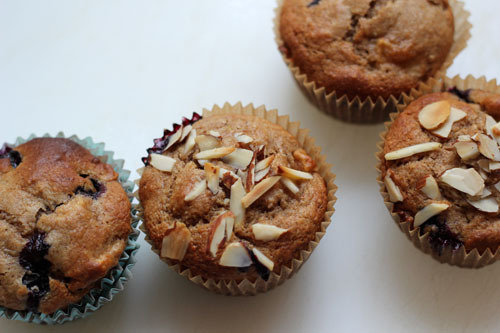 So to help you at least start out on the right foot, I offer you these very healthy, super duper soft and lightly spiced cardamom and cinnamon, apple-blueberry muffins. Our biggest losers group started our diets again this weekend and weighed in. I brought muffins to share, and yes, I am a little evil.I am totally OK with my darker side. But the muffins were only 144 calories and 4.6 grams of fat AND they contained apples, blueberries, yogurt, wheat flour and almond flour! So it wasn’t that evil. If I were really evil, I would have dropped off care sabotage packages this morning on their front porches with slices of my husband’s Chocolate Peanut Butter Birthday cake inside. What was unexpected was that they were some of the softest, yummiest muffins I ever made. Since I hadn’t tasted them (must weigh-in before eating you see…the fraction of a pound matters in this little contest), I pathetically made excuses about their mediocrity before serving them. Big mistake. There was no mediocrity to be found in these fluffy gems. They actually had the most heavenly, tender crumb and the spices and fruits made them ooze with natural fruity goodness. See the oozing below? Then why did I second guess myself, and why did I feel the need to excuse them, without even trying them? (second guessing is fairly common place for me). It’s probably because I usually shoot for perfection in just about everything, especially baked goods, and perfection is fairly hard to come by I’m afraid. So, that being said, I am rarely totally happy with my outcome. I pondered this little bit of introspection and suddenly came up with my New Year’s resolution. I hadn’t made one yet, and it was already January 10th! “Bad, bad, bad!”, I had been thinking. Need a resolution—yesterday. How else does one strive to improve, better themselves and become all that they can be?! But then it hit me, my resolution would be to “Be Mediocre”. Yep, I came up with that little kernel of brilliance this morning. I know, you are wondering why YOU never came up with such a life altering New Year’s resolution. Maybe because you have loftier goals my friend. So, on my way to work (an hour late), I developed my new philosophy on life…go for mediocre and maybe for once I will be happy with my efforts. If my house is pretty clean then I have met my goal. I am now officially 1 for 1. I ate the smallest slice I could cut of earth shattering Chocolate Peanut Butter cake for BREAKFAST this morning but Lean Cuisine for lunch. I believe my “healthy” eating for the day has averaged out to mediocre (no comments from the peanut gallery please Lisa and Joanne; I know all the crazy crap that is in a Lean Cuisine). Now I am 2 for 2. See how this works? So today I have been an OK mom (made healthy lunches to take to school BUT frozen pancakes for breakfast), an OK employee (arrived late but worked hard while I was there) and an OK dieter (refer to paragraph above if you have problems with short term memory). That means I am totally, 100% meeting my expectations. Perhaps I am the one person on earth who will finish the year keeping her New Year’s resolution. I will let you know how it goes next December. Okey dokey? By the way, my hubby is a graphic artist. I have commissioned him to come up with a t-shirt with the slogan, “B. Mediocre”. He came up with the “B.” part. Thanks honey. Also on the, “Geni is crazier than I thought,” front my dad has his own brilliant idea for a website…F-You.com (to keep my PG rating, please think fooey). It’s where people can go to send anonymous emails to people (ahem perhaps flirtatious bosses, unfair teachers, bullies at school, you got it…keep goin’ now) so that they can finally tell the lovely soul just what they think without any consequences. I, taking his idea fairly seriously, tried to explain to him that F-You.com as the “from” in any email doesn’t stand a snowball’s chance in the hot place to get by the ol’ spam filter. We actually debated this. Several times. Now you know where most of the crazy comes from. In case you were curious. To make the muffins: Preheat your oven to 400 degrees Fahrenheit. Line your muffin pan with muffin cups. In a large mixing bowl, lightly spoon your flour into a measuring cup, don’t pack. This is probably the number one reason for dry muffins…too much flour. I usually stir up my flour before spooning to get it light and fluffy and then gently spoon it into my measuring cup,leveling it with my handy index finger (or use a knife). Whisk together flours through baking soda. Important to whisk so that it gets well mixed and fluffed up a bit. In a separate bowl, beat together brown sugar and egg. Add the rest of the liquid ingredients; apple sauce through apple cider. Beat together with a whisk. Before adding the liquid to the dry ingredients: In the bowl of the dry ingredients, stir in the blueberries and chopped apples. This will amply coat the fruit in flour and help them to stay in the middle of the muffin when baking, instead of sinking to the bottom. Now, add 1/2 of the liquid ingredients to the dry ingredients and stir gently with a rubber spatula (no whisking now my friends…batter will be tough as nails if you whisk now). Add the rest of the liquid ingredients and stir together until just combine. Scrape the bottom and the sides of the bowl to make sure no left behind flour is there. I use a medium-sized ice cream scoop to fill each muffin cup 2/3 full. Top with a large pinch of sliced almonds. Bake for 15-20 minutes depending on your oven. With convection…probably 15. Check for golden-ness and press your finger atop. It should be slightly firm or go for the old stand-by toothpick test. 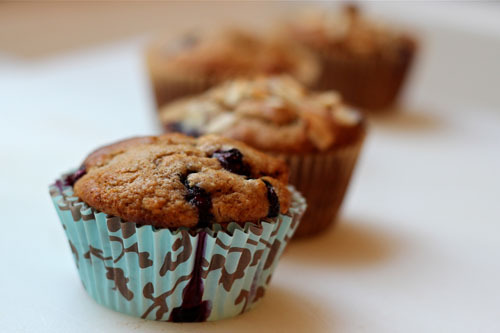 Categories: Bread | Tags: apple blueberry muffins, low calorie muffins, low-fat muffins, New Year's resolutions | Permalink. 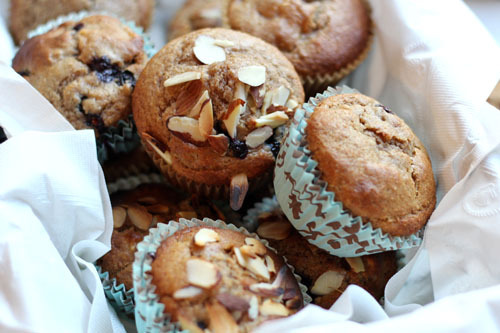 A perfectly healthy and delicious muffin to kick start the day and new year! Ooohh Yummy! Will give these a go. Happy new year! Blueberry muffins are my favorite. I like the addition of apples and the healthy twist. Happy New Year! Happy New Year to you too Raymund! Thank you! That is so true. Good point. Thank you for commenting! 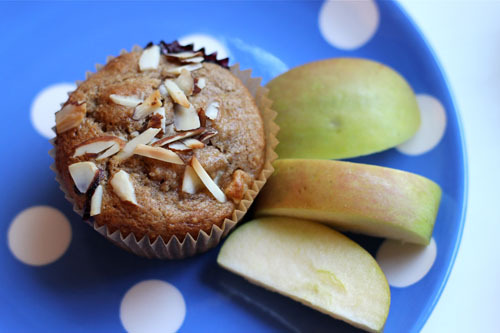 A healthy muffin to start the day is also a nice way to start the new year. Wishing you all the best for the new year. Wishing you a wonderful new year too Karen. THank you!